I bought a stewing chicken at the market this morning thinking there were several more recipes in The New Galt Cook Book (1898) that required simmering a chicken for hours. In fact most of the chicken recipes are for fried or fricasseed chicken. I decided to try Mrs. A. Taylor’s recipe for Chicken Pot Pie. The first direction says to stew a nice chicken. What is a nice chicken? One that is polite? Does this mean a healthy chicken? A fresh chicken? One that is large? I’m using an anonymous chicken from the market. The sign in the display case said it was an older Leghorn. I put it whole in a pot of cold water and left it to simmer for several hours. Once it seemed cooked I removed the chicken and continued with the rest of the recipe. I added some salt and pepper to the broth and created a paste of 1 tablespoon of flour and 1 tablespoon of butter. I found it challenging to add this paste to the broth without ending up with lumps. 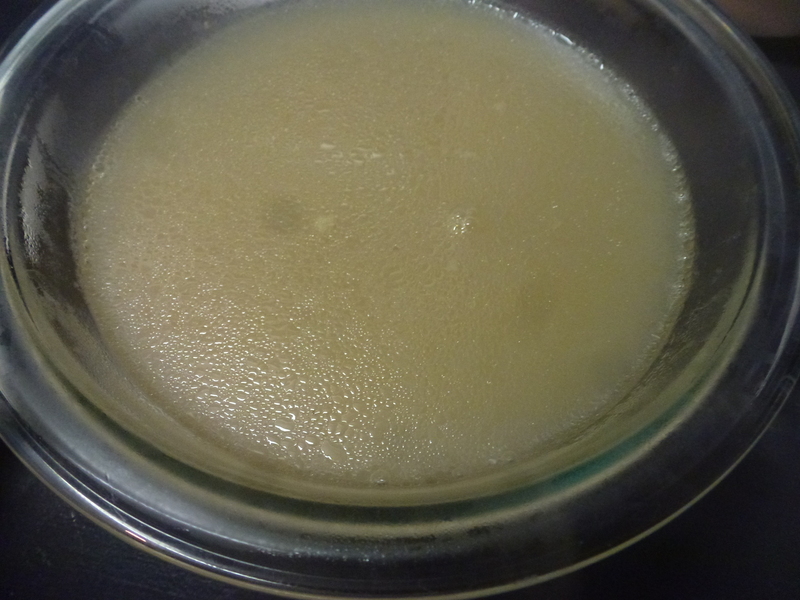 I think it would be better to add some of the broth slowly to the paste to create a warm liquid and then stir it in. I ended up thickening with a bit of corn starch. Next I put the squares of biscuit dough in on top of the hot liquid. I made an ordinary biscuit. I soon discovered that the biscuits need to be a bit thicker or sturdier than mine as they started to disintegrate at the edges after a few minutes of boiling. I left them in and eventually they became more like flat dumplings. I put some chicken, gravy and biscuit on a plate to sample. Mrs. A. Taylor contributed many recipes so I’ve talked about her a few times including on day 88 . For a woman involved in creating this cook book I struggle with her recipes. Sometimes it is my fault either I’ve made a mistake or I’ve misinterpreted her recipe but other times she just shares strange recipes. Also some of the recipes don’t have clear instructions. I wonder if she was a good cook? Margaret “Maggie” Fisher married Alfred Taylor and had three children. In 1898 she was approaching her 50th birthday. Her eldest son had died of pneumonia 12 years ago when he nine and the remaining two children lived at home. Mrs. Taylor has another recipe for Chicken Pot Pie that appears just under the first. 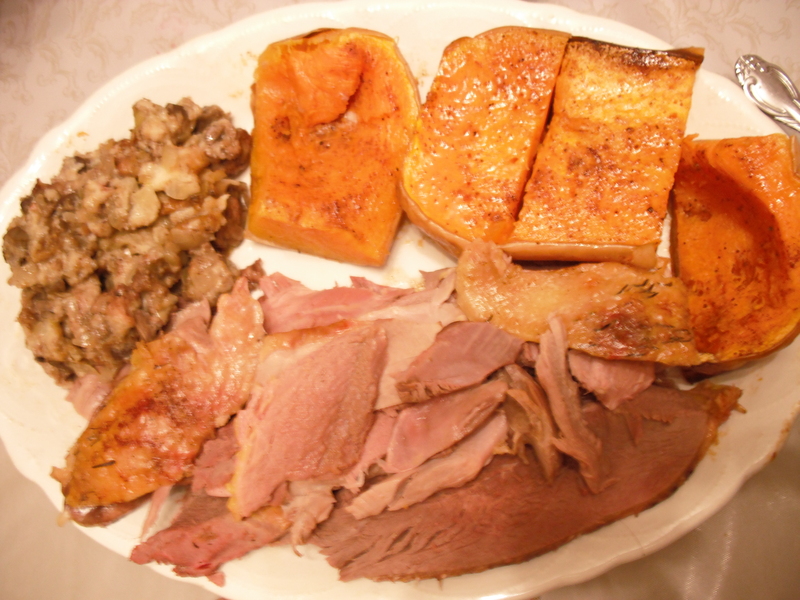 I’d decided to do the same below as the recipes are very similar except for the final plating. Instead of boiling the biscuits in the gravy, baked biscuits are placed on the plate alongside the chicken and then gravy is spooned over top. I think this would be a much better version. I ended up with something I’d consider chicken and dumplings rather than pot pie. Even if the biscuits were baked first and then placed on top of the gravy it would resemble a slightly more familiar version of pot pie. My verdict with Mrs. A. Taylor’s first version of chicken pot pie is don’t bother. Make your usual chicken and dumplings or try her second version instead. Have ready biscuit dough cut in square pieces, and bake in the oven. Split them and put on a platter, and our your gravy over them, putting chicken in the centre. I bought a chicken at the Kitchener Market on Saturday. It was labeled as a stewing hen and an old one at that, so it is perfect for making a rich tasting chicken broth. Stocks and broth are an important base for some of the savoury recipes in The New Galt Cook Book (1898). Although today we can buy a carton or can of broth, homemade was the main option at the end of the 19th century. I’m using Mrs. A. Taylor‘s recipe for Chicken Broth but I’m also going to share some of the information about Poultry from The New Galt Cook Book including How to Draw a Fowl. That is not about art but about butchering. No contributor is attributed to this information. How do you buy chicken? Today we have a number of choices when buying chicken but the one most of us never see, at least not in Waterloo Region, is the opportunity to turn a live chicken into supper. We don’t even see poultry that resembles the bird. There are no feathers on our chickens and unless you enter some specialty stores poultry doesn’t even have feet or heads. Many people buy chicken parts — a package of boneless breast, chicken wings, or thighs — rather than a whole roasting or stewing bird. One of the most memorable meals I ever had was in the north-eastern part of Thailand. Everything served had been grown, raised and cooked right there by the farmer — an amazing woman raising a family on her own — and that included the chicken. It had been running around the yard a short time before it became supper. 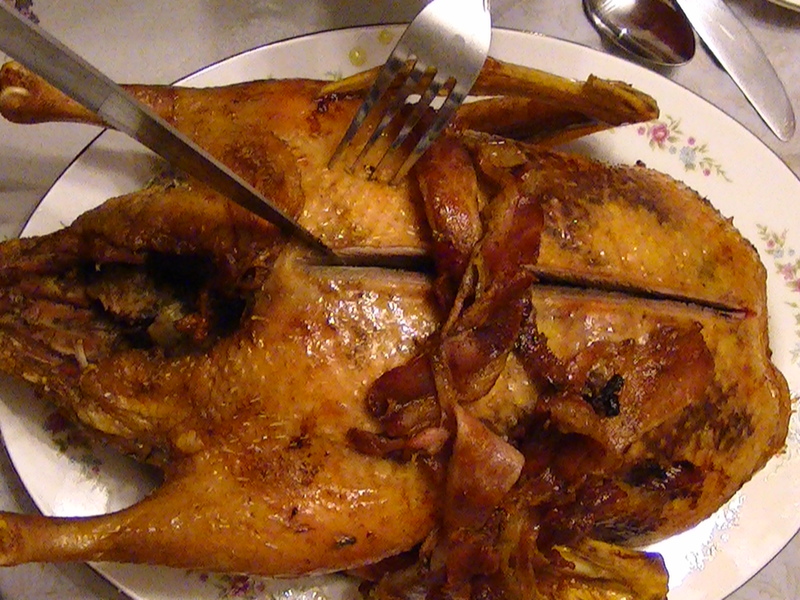 The feathers and blood were saved and each part of the bird was cooked including the feet. In the 1890s the chicken dinner could come from the yard or from a butcher shop or market stall like this at the Berlin Ontario Market. 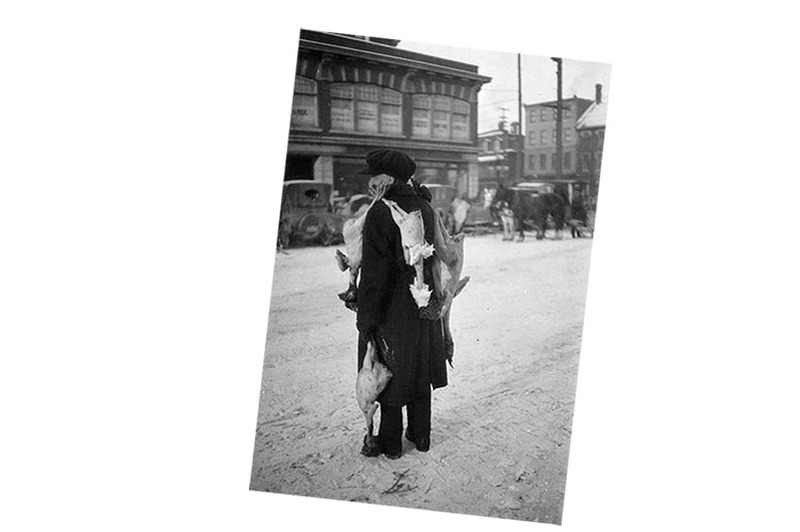 The information about how to Draw a Fowl would be useful for anyone who was buying a live or partially prepared chicken like in this photo from the Byward Market in Ottawa in the 1920s. Fortunately the chicken I bought had been killed, plucked, and cleaned (drawn) so I just needed to cut it up — a more challenging task than I expected. A sharp knife is important and I found it difficult to cut through the skin. I realized that I’ve always cut a chicken after it was cooked. I managed to split it open and partially remove the wings and legs. 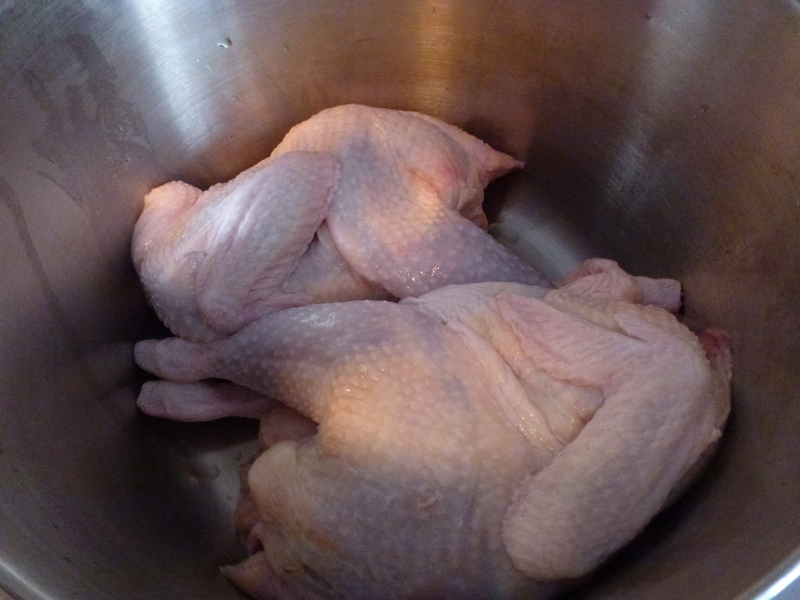 I put the chicken in a stewing pot and added 6 cups (3 pints) of cold water. I put the pot on the stove and turned the heat to medium. I measured half a cup of rice and put it in with the chicken. I decided to use rice in honour of that long ago chicken meal in Thailand. I added a few shakes of salt and covered the pot. I turned the heat down and left it to simmer for one hour. Close your eyes and imagine the smell — a very nice chicken soup smell. 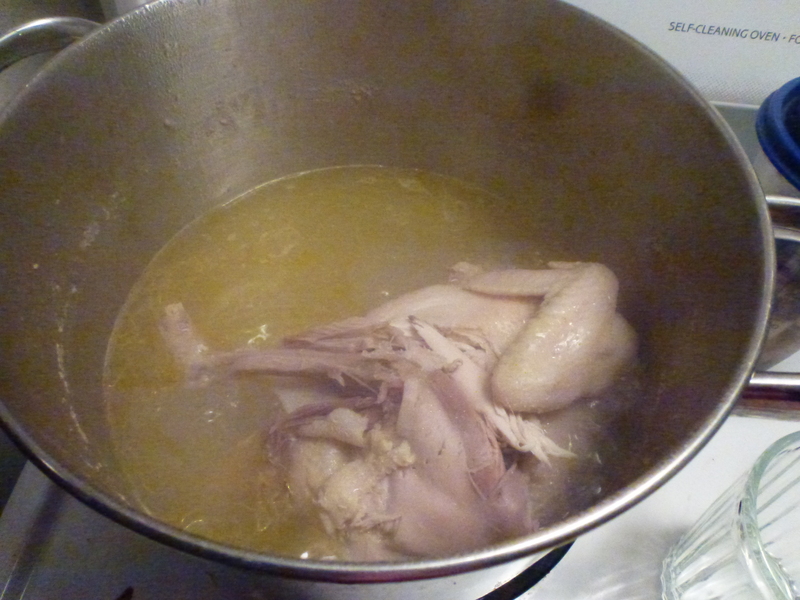 After an hour, I removed the chicken to a plate and poured the broth in a large bowl. I had to scoop some of the rice out of the chicken. I added pepper to the broth and put a bit of butter on the plated chicken. It was time for sampling. Mrs. A. Taylor contributed many recipes and I’ve already made several of them. Until her marriage to Alfred Taylor a dry goods merchant she was known as Maggie (Margaret) Fisher. By the time this cook book appears she is a well established Galt matron living in a lovely home on Grand Avenue in Galt. 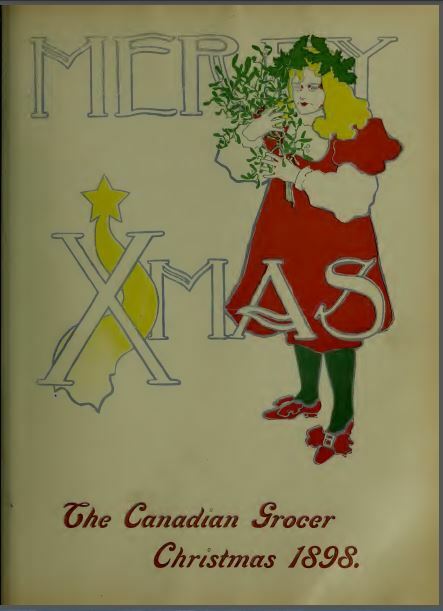 Her card is one of the visiting cards saved by the Stirling McGregor family and donated to the Cambridge Archives. Just imagine her coming out of her home to pay a call on Mrs. McGregor. You can see the house here. I’m not sure how Mrs. A. Taylor (Maggie) served her chicken broth but it is very good. 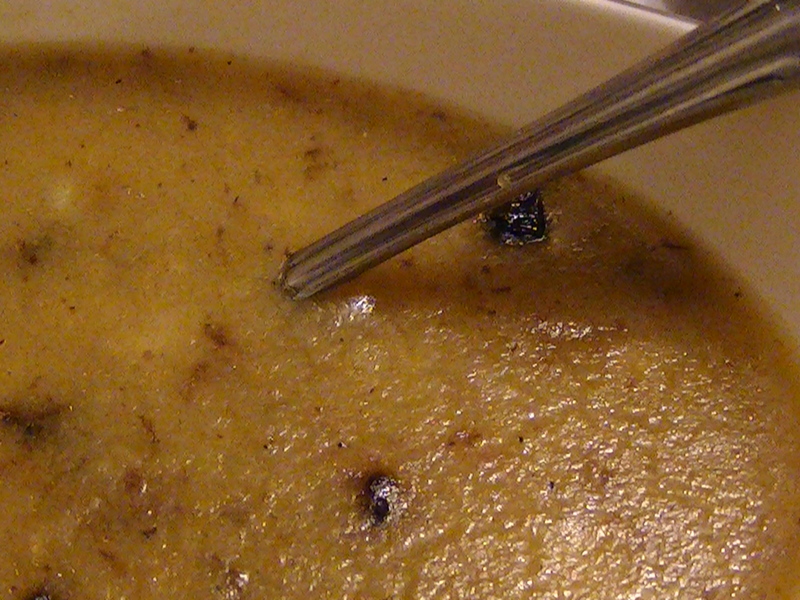 This sort of simple soup could be served at the beginning of a family or company meal. There’s nothing really different about it but it is nice to know everything that went into the broth. I don’t know the history of the chicken but at least I know the rest of the ingredients. This broth makes a good base for other soup recipes and it is basically chicken and rice soup. The rice was starting to get mushy. 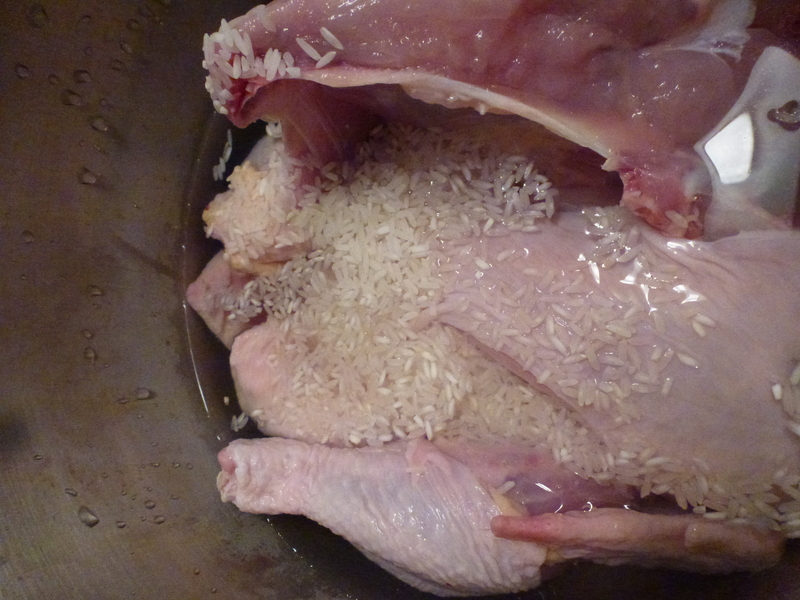 Add it a little later in the cooking time if you prefer a firmer rice in your soup. The chicken meat however was tough. I think it needs to cook longer than one hour indicated in Mrs. A.Taylor’s recipe. The chicken was cooked but wasn’t tender. Give the Chicken Broth recipe a try if you can find a flavourful chicken and be grateful you don’t need the other recipes. To judge the age of a fowl touch the end of the breast bone; if it bends easily from side to side the fowl is young. The skin of the chicken should be firm, smooth and white. If a fowl is tough rub it inside with a teaspoonful of baking soda, being careful to wipe it off before cooking it; it is also good for tough meat. Lumps of charcoal put with fowls when they are a little tainted will restore the flavor. Slices of lemon cut into small pieces and stirred into drawn butter and allowed to come to the boiling point, served with fowl is a fine addition. 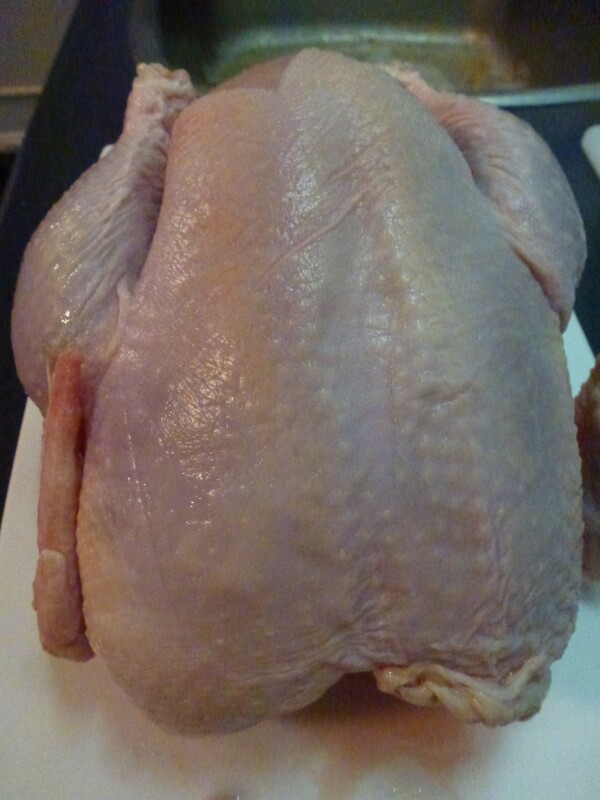 The inside of poultry should be ribbed with salt after it is drawn. It is not every housekeeper that understands how to draw a fowl so that all the interior parts come out in one piece. In order to do this, first split the skin on the back of the neck and turn it back over the neck. Loosen the pipes around the neck with the finger. Remove all fat that can be reached under the skin and lay it aside for use. When this is done, cut with a sharp-pointed knife from the leg to and around the vent, in order to open the chicken. Pass the hand up the back of the chicken on the inside carefully till you reach two little ligaments near the wings, which seem to bind the intestines down to the back. Loosen them and pull slowly and firmly, and all the pipes in the neck, with the entire mass of intestines, will come out together without breaking. When they are on a plate it is easy enough to cut out the gall bladder and separate the liver and other giblets from the parts that are to be thrown away. The fat of poultry should always be taken out of the bird, because it gives a strong taste if cooked in it, but it should be saved, as it has many uses in cookery, except in the case of turkeys, geese and ducks, when it is too strong. Goose oil is saved for medicinal purposes by prudent mothers, and that of turkeys and ducks may well be added to the soap-fat can. One chicken, three pints of water half a teacupful of pearl barley or rice, pepper and salt. Cut up the chicken put it in the cold water with the barley or rice and salt, cover it close and let it simmer for an hour, add pepper to your taste. 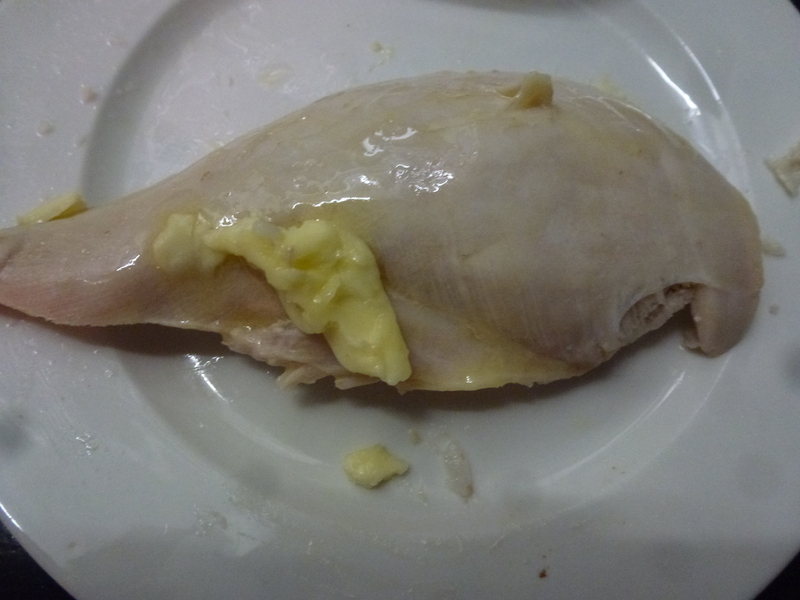 The chicken my be placed on a plate with pieces of butter over it. I bought two stewing hens at the Kitchener Market today. I’d planned to make chicken soup but discovered a recipe for Cream Chicken in The New Galt Cook Book (1898) and decided to try it instead. 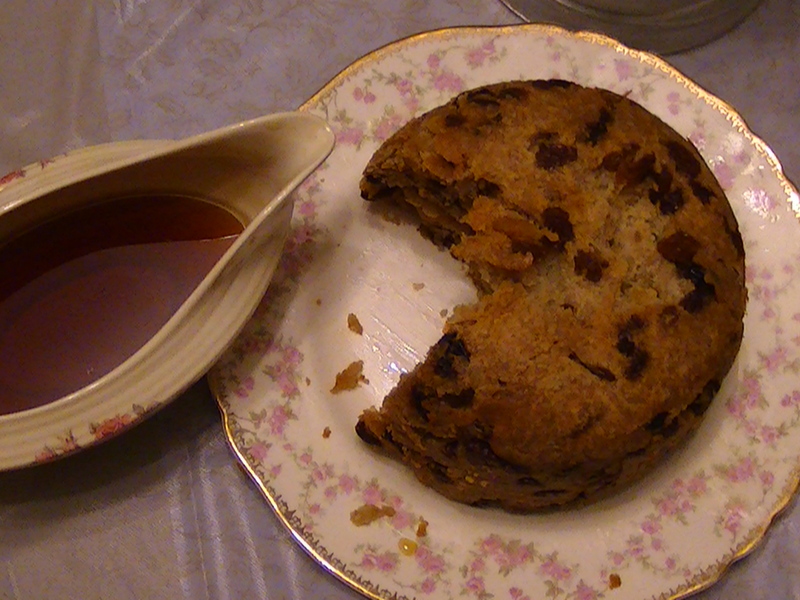 Mrs. H. Howell contributed the recipe. Two chickens in the pot. I started by stewing the chickens. I washed the two chickens and then put them in a pot with enough water to cover them. I turned the heat low, covered the pot, and left it alone for two hours. I checked a few times and topped up the water once. 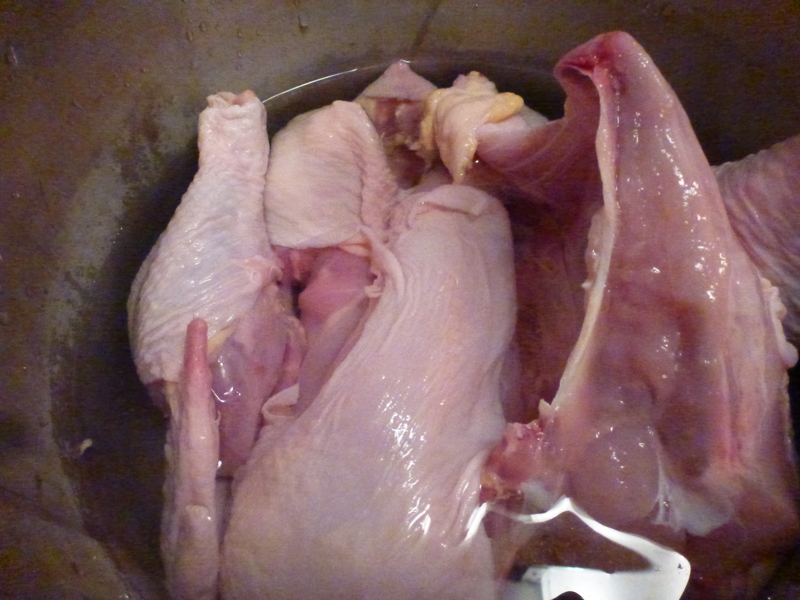 I removed the cooked chickens and started picking them apart discarding bones and skins and keeping the meat. I ended up with about three cups of meat. I chopped it up into chunks and continued with the rest of the recipe. I had no idea what canned mushrooms would be like in 1898. Is this home or commercially canned? What size container? I decided to use modern canned mushrooms and use an amount suitable to the quantity of chicken. I discovered I didn’t have a can of mushrooms so I decided to use some fresh mushrooms from the fridge. I took a handful and chopped them finely as indicated in the recipe. I mixed them in with the chicken and sprinkled everything with a half teaspoon of salt and the same of pepper. 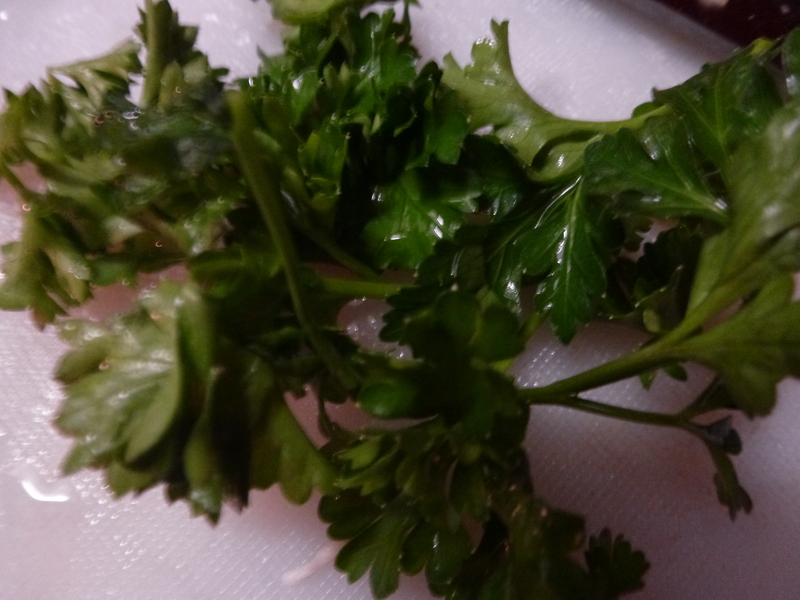 I chopped some parsley and mixed it in too. I’m not sure if Mrs. Howell was able to obtain parsley in the winter. This was a wealthy family so the could probably get it through a green house or simply keep a pot growing in a window all winter. Mrs. H. Howell is Frances Annie Dodd. She was born in Queenstown Australia in 1862. Her future husband Henry Spencer Howell was born in Galt Ontario. For some reason he went to Australia where he met and married Frances in 1883. Henry’s father Daniel owned a woolen mill. Henry returned to Canada with his new wife and they soon had one son Laurence. After the death of his father they lived with Henry’s mother Sarah at Stonyhurst. She also contributed recipes to the cook book. According to a book called Cambridge Mosaic, Henry was quite the world traveller and even wrote a book about his travels called Island Paradise and Reminiscences of Travel. The second edition of his book can be read here. Then in the summer of 1908 when she was 46 years old Frances became sick. She died in December of heart failure as the result of tuberculosis of the bowels according to her death certificate. The next month Henry’s mother died. The following month Frances and Henry’s son Laurence married and he and his wife lived with his father until his death in 1912. Henry was in his fifties when he died from a gunshot while cleaning his old Enfield rifle. All this tragedy was in the future when Frances shared her recipe for Cream Chicken. Cream Chicken ready to eat. I did not have high expectations for Cream Chicken but was pleasantly surprised. This is a simple and delicious recipe. 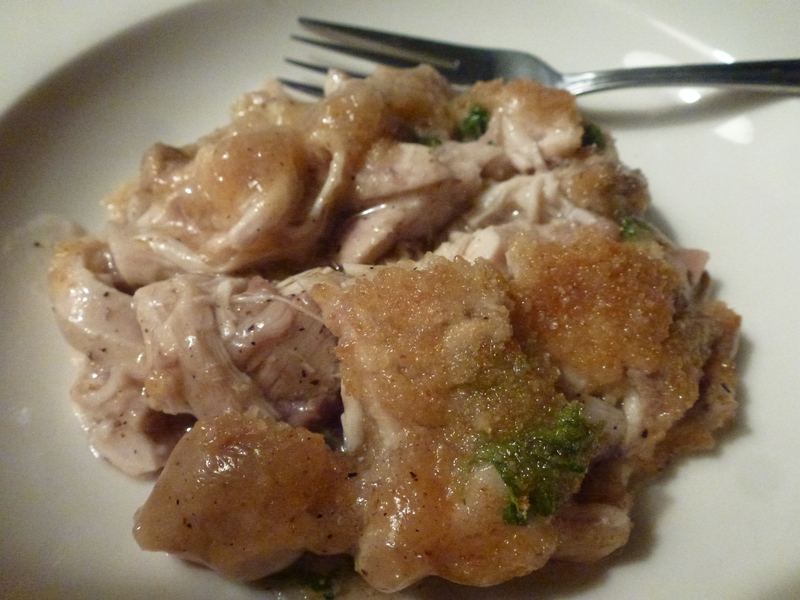 Cream Chicken tastes amazing and it is very easy to envision it in a modern context. It is fine as is but could be enhanced by sauteing the mushrooms a little before adding to the chicken. Using another fresh herb instead of parsley could make this dish even better. I think I used just a little too much pepper but you can season to your taste. I wonder how Frances served Cream Chicken. It would be easy for her mother in law to eat if her teeth were not in good shape. 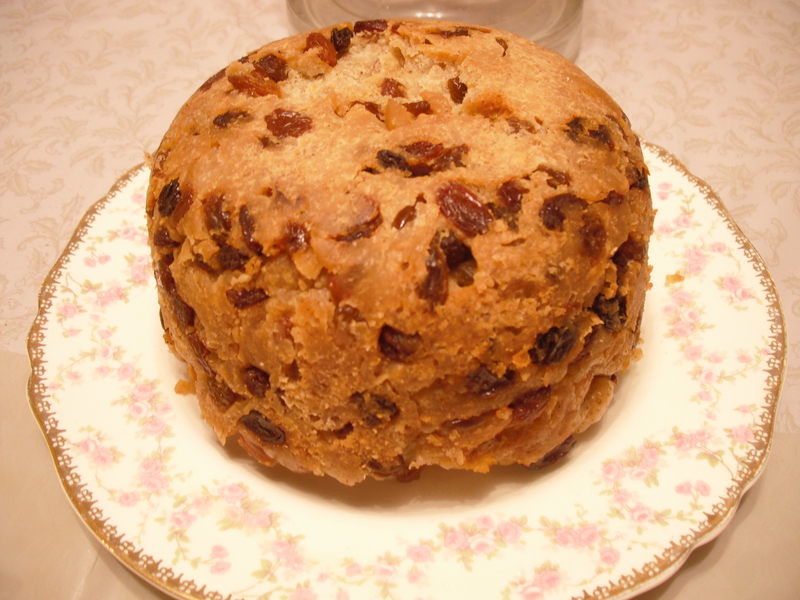 It would also suit a ladies luncheon and yet it is hearty enough to please her husband and son. What was served with it? What are you going to serve with Cream Chicken? I’m going to make this again. This is another recipe that time travels from the 19th century to the 21st with ease. Stew two chickens until tender, remove bones and skin, chop rather coarsely, season with salt and pepper and a little parsley, add one can of mushroom and take two small cups of the liquid of the chicken and thicken with a little corn starch and put in a dish. spread over the top very fine bread crumbs and brown in the oven. 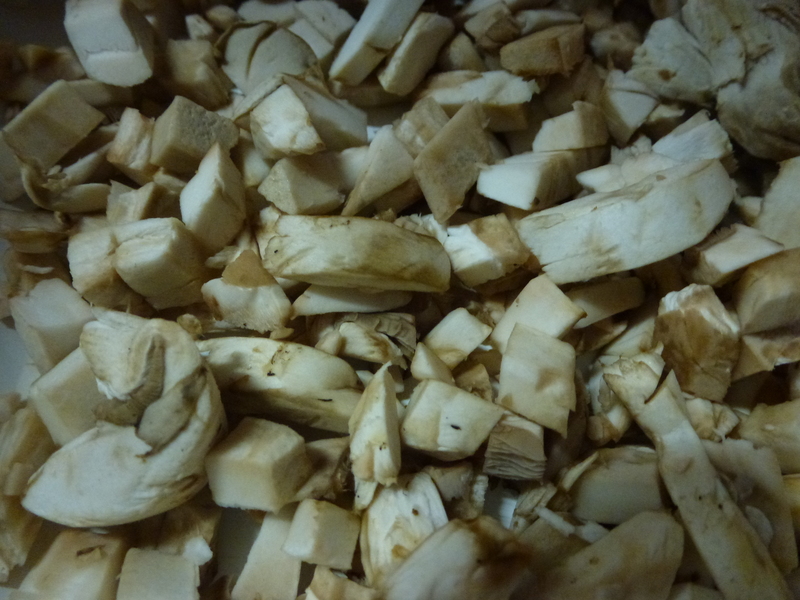 Cut up mushroom fine.